New collector products brighten the latest batch of sales figures from United States Mint. The agency released a new coin or set on every day last week except one. 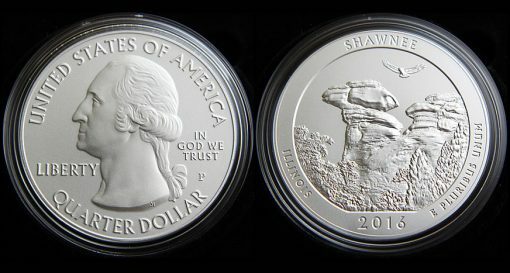 Kicking things off, the 2016 Shawnee National Forest Quarters Three-Coin Set debuted on Monday, Feb. 22 for $9.95. The product logged opening sales of 10,086 sets. The previous set with last year’s Saratoga quarters reached 11,041. Aside from it, however, you have to look back 4 years to find any that started quicker. On Tuesday, Feb. 23, the U.S. Mint re-launched the 2016 ATB Quarters Proof Set for $14.95. The set of five clad proof quarters registered sales of 38,733. Of that amount, about 12,000 are from January when the set sold for a few days until a packaging error was discovered. Last year’s release notched sales of 42,741 sets during the first six days. Rolls and bags of 2016 Kennedy half-dollars debuted on Wednesday, Feb. 24, and they posted opening sales totaling 1,150,320 coins. Unit splits were 11,358 in two-roll sets and 3,480 in 200-coin bags. The set offers a roll of 20 coins produced at the Denver Mint and a roll of 20 coins from the Philadelphia Mint for $32.95. Priced at $139.95, bags include 100 coins from each U.S. Mint facility. All of the new products were among the Mint’s top weekly sellers. The U.S. Mint published sales updates to 234 numismatic products. Ninety-six of them outperformed their prior weekly sales compared to 108 previously. Four of them increased by more than 1,000 units compared to 5 previously. Twelve had their sales reduced compared to 10 previously. Below are tables showing the latest sales for U.S. Mint numismatic products. The sales period covers Feb. 22 to 28. Products with an asterisk (*) are no longer available. I am still shocked at the low sales figures for the Mark Twain commemorative coins! Only about 15,100 $5 gold coins sold & only about 68,000 of the silver $1 coins sold total including Proof & Uncirculated versions. These two coins have great designs on both obverse & reverse sides (Kudos to the U.S. Mint designers & sculptors-engravers!) What is the deal with such low sales? I’m not surprised. I’m of the Mark Twain era of reading books in school growing up, but I feel that today’s youth have no idea or interest in Mark Twain, or that era of life. I did not buy into the coin program myself. Mintage totals are way too high, but I’ll keep watching to see how sales go. If they are low enough by the end of the year I may pick up the gold proof and Unc. I’m really surprised that the Mint is STILL selling the 4 coin silver Kennedy 50th Anniversary set. That’s pushing 2 years old. Is there a deadline on this one? The Mint must have made the full mintage totals on these or they would not have these to sell anymore. I suppose with the price of silver, it’s still a money maker. I too read Twain’s works in school. I loved “A Connecticut Yankee in King Arthur’s Court” & the original movie version too! I guess the younger generations are missing out on some fantastic reading & learning. Just Twain’s famous quotes throughout his lifetime fill a book. The Mint must have thought they would sell all 225,000 Kennedy 2014 silver 4-coin sets quickly, but many still sit in their fulfillment warehouse in Memphis, Tennessee & their is no cutoff date for sales of these sets! That special packaging alone cost them a pretty “penny” even though it wasn’t wood, it was a custom job at their packaging vendor. I guess they will sell out some year down the road. I think you’re also implying that younger generations are collecting coins. Oh I think the only things they collect are… Apps !